Tungsten copper functionally graded material means one side is pure tungsten or high tungsten content material, another side is pure copper or high copper content alloy, the middle gradient change transition, tungsten, copper gradient material thus produced has a very specific function and a good prospect. Development of tungsten-copper functionally graded material is due along with the development of high-tech aerospace and other fields, the material requirements more stringent. The heat-resistant ceramics and metals can not meet a single homogeneous materials such harsh working conditions, must develop a new material to meet the requirements of aerospace technology development, tungsten, copper functionally graded material is presented in this context. 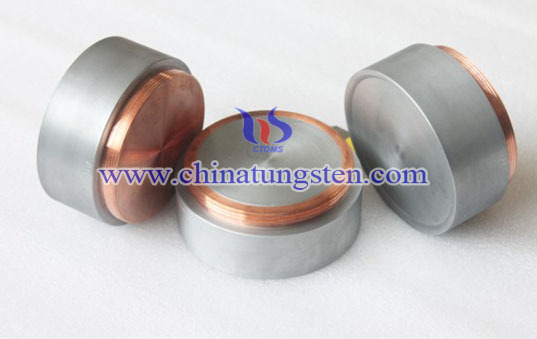 Tungsten copper functionally graded material design objective is to get the best materials and compositional distribution, optimize their size and distribution of thermal stress in the course of preparation and service produced. With the high rate of heat generation power microwave semiconductor device continued miniaturization of highly integrated, high-power development caused by the existing homogeneous tungsten-copper composite material is difficult to meet the electronic substrate in a good heat dissipation, low coefficient of thermal expansion close two requirements while functionally graded material is considered an effective way to solve this problem. Tungsten-copper composite material gradient in addition to conventional tungsten-copper composite material having a flexural strength, thermal conductivity also has the special thermal shock and thermal fatigue resistance. Material to withstand sudden changes in temperature without breaking ability called thermal shock resistance, and thermal fatigue properties is the ability of the material at a certain temperature difference after several cycles without being damaged. Thermal shock resistance and thermal fatigue properties of the material is its overall performance mechanical properties and thermal properties. Because of functionally gradient materials using relatively harsh environment, usually at a high temperature, heat-resistant environment, therefore, functionally gradient material high temperature performance is an important means to evaluate its performance. Design of functionally graded materials different from the traditional method of design material, which is mainly based on the structure of the environment needed to design composition distribution. First, choose the right materials and proper preparation, then the temperature distribution and thermal stress calculation based on physical parameters and boundary conditions of the material. Common method of thermal stress calculation is analytical method and finite element method. 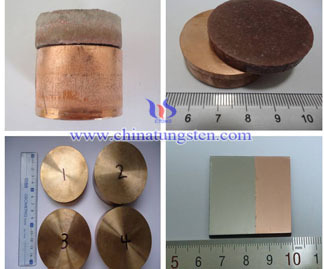 In order to prepare tungsten copper functionally graded material with the best performance, while reducing the blindness prepared prior to the preparation of graded material, it is necessary first of FGM reasonable thermal stress relaxation design. Currently, the process for producing tungsten-copper functionally graded materials mainly infiltration method, powder metallurgy, plasma spraying method, a vapor deposition method and SHS combustion synthesis and so on.